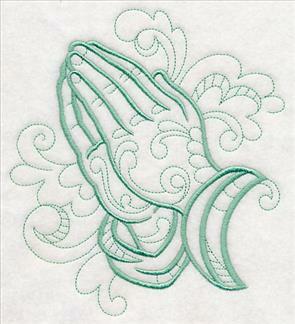 Stitch embroidered blessings on your next project with these faithful designs! 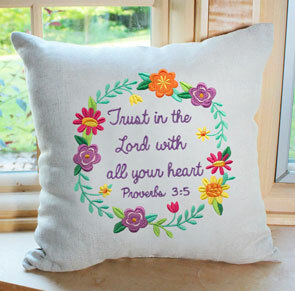 Words of prayer and wisdom shine on pillows, totes, and wall hangings, whether they're beautiful Bible verse wreaths or praiseful sayings and samplers. 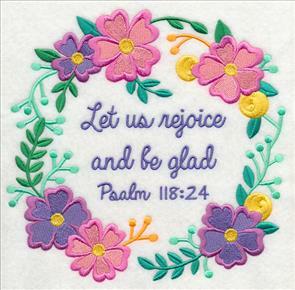 Elegant Battenburg lace medallions are full of elegance and reverence, while one-color doodles make spirited stitching a breeze. 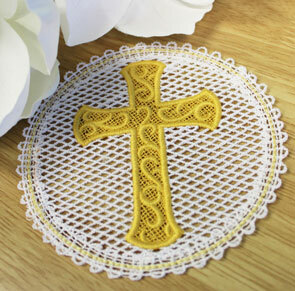 Plus, new crosses will shine on altar cloths, Bible covers, and more. 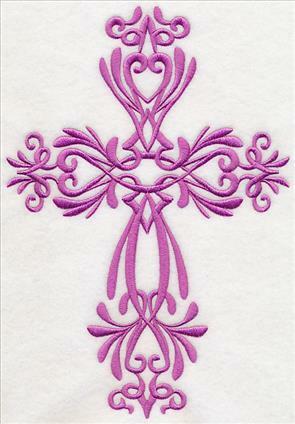 Scroll down the page to see these beautiful new designs, and order today! 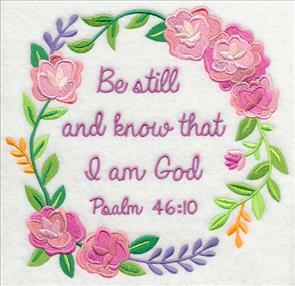 The flowers, swirls, and brilliant colors in these heavenly words make a beautiful statement on pillows, framed pieces, wall hangings, and more. 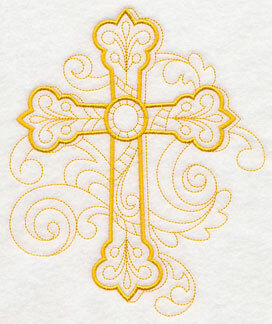 The detailed, exquisite designs are a gorgeous way to share your faith. 8.91" x 4.48" and 7.12" x 3.58"
9.31" x 5.29" and 7.45" x 4.23"
6.19" x 3.52" and 5.45" x 3.10"
Not only are the designs fabulous for home decor, but they shine on tote bags, sweatshirts, and quilt blocks, too! 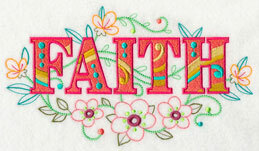 Add a spirited look to your next embroidery project with these faith-filled designs. 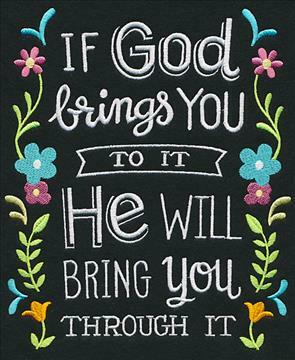 9.35" x 4.66" and 7.48" x 3.73" and 6.22" x 3.10" and 5.47" x 2.73"
Share your favorite scriptures on pillows, wall hangings, placemats, and more! 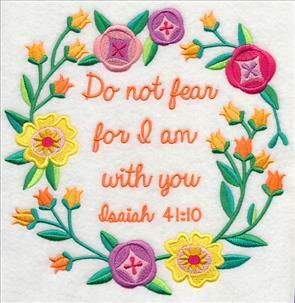 Beautiful Bible verses are surrounded by whimsical wreaths in these gorgeous motifs. 7.49" x 7.79" and 6.89" x 7.17"
7.62" x 7.81" and 6.90" x 7.08"
5.86" x 6.01" and 4.86" x 4.99"
These wreaths are a sweet addition to home decor, such as this gorgeous pillow. 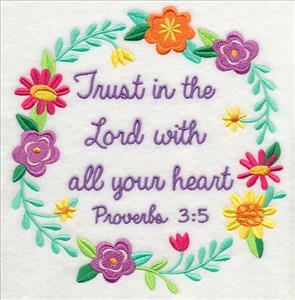 Stitch multiple sayings as a set, or pick your favorite to stitch alone. 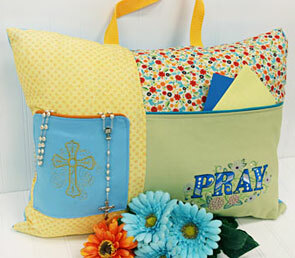 Find fabulous pillow tutorials on the project website, or in our Pillow Party Lookbook and videos. 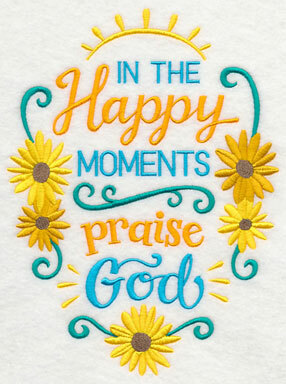 "This is the day the Lord has made, let us rejoice and be glad." 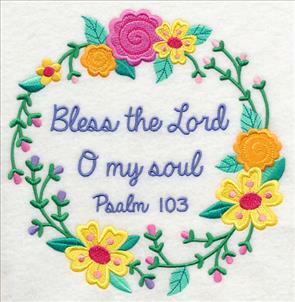 This pair of blessings is inspiring on a set of pillows, either side of a tote bag, and more. 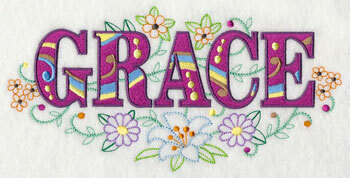 7.79" x 7.69" and 6.98" x 6.89"
7.81" x 7.57" and 7.12" x 6.90"
6.05" x 5.86" and 5.03" x 4.88"
Bright colors and blooming flowers encircle these Bible verses with the beauty of God's creations. 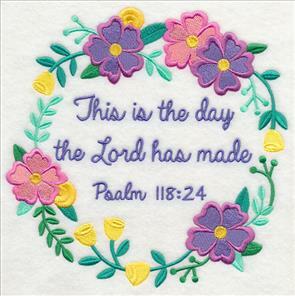 Stitch to bring a light and joyful look to tote bags, pillows and more. 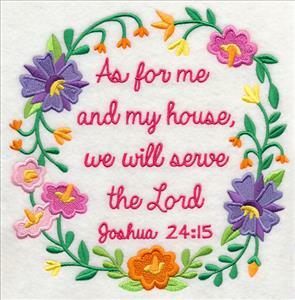 7.73" x 7.81" and 6.90" x 6.98"
7.81" x 7.68" and 7.02" x 6.90"
5.96" x 5.86" and 4.93" x 4.85"
Fill your home with these embroidered blessings: They're fabulous for table runners, wall hangings, framed art, and more. 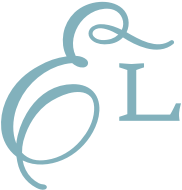 7.81" x 7.44" and 6.94" x 6.61"
7.74" x 7.81" and 6.90" x 6.97"
5.86" x 5.92" and 4.85" x 4.90"
Graceful baroque and elegant swirls give religious doodles a timeless, sophisticated style. 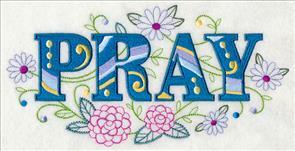 Add the light-stitching designs to tea towels, quilts, and more decorations for church and home. 5.85" x 6.36" and 4.84" x 5.27"
5.85" x 6.96" and 4.84" x 5.76"
3.24" x 3.85" and 2.52" x 3.01"
The one-color designs are full of faith and joy, and are also delightfully quick-to-stitch! 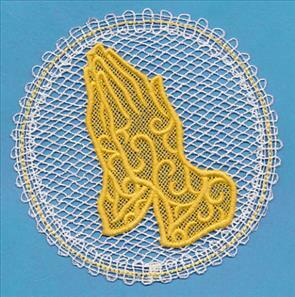 Perfect for Bible covers, towels, wall hangings, altar cloths, and more. 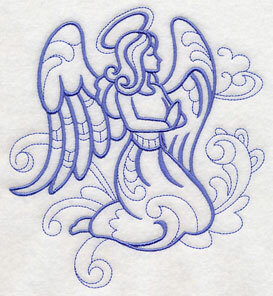 5.85" x 6.91" and 4.86" x 5.73"
5.85" x 5.98" and 4.85" x 4.96"
3.77" x 3.86" and 2.93" x 3.00"
A serene angel and classic baptismal clamshell are stunning in the doodle style. Stitch on low-nap fabrics, such as twill, denim, canvas, linen, and more for best results. 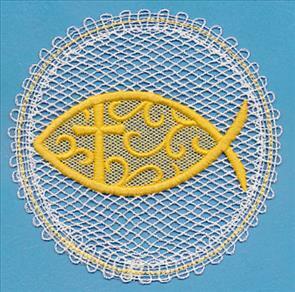 5.85" x 6.35" and 4.85" x 5.26"
3.87" x 3.90" and 2.98" x 3.01"
An ichthys, or "Jesus fish," finishes this group of spirited stitches. 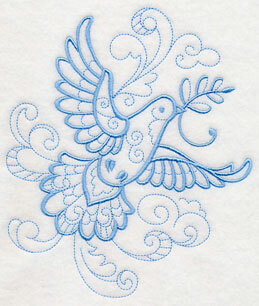 A terrific design for your next embroidery project! 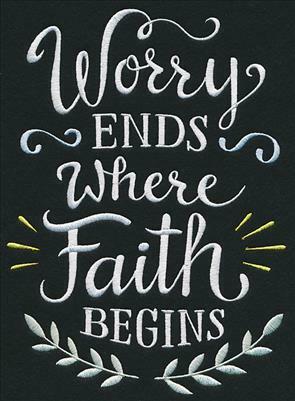 8.12" x 5.85" and 6.73" x 4.85" and 3.89" x 2.80" and 2.99" x 2.16"
We've collected some of our favorite faithful sayings -- perfect for tote bags, pillows, welcome flags, and more! 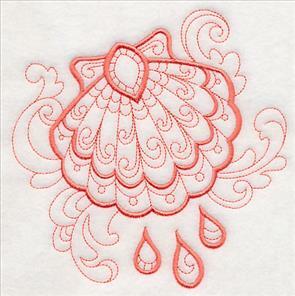 This design has been stitched in the chalkboard style, and it's equally striking on colorful or neutral fabrics, too. 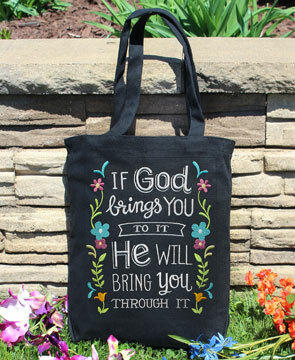 6.58" x 7.81" and 5.85" x 6.95" and 4.85" x 5.76"
Spread God's love wherever you go with an embroidered tote bag. 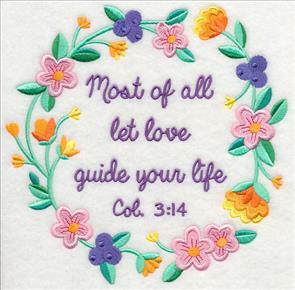 Words of wisdom and praise are inspiring additions to uplifting quilts, Bible covers, wall hangings, and other spirited projects. 6.90" x 9.51" and 5.67" x 7.81"
6.91" x 10.23" and 5.85" x 8.68"
5.26" x 7.80" and 4.63" x 6.86"
"In the happy moments, praise God. 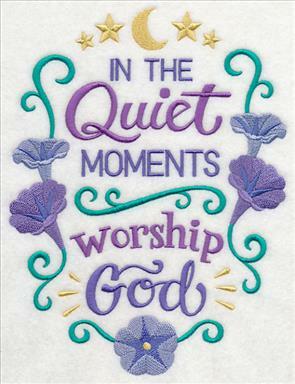 In the quiet moments, worship God. 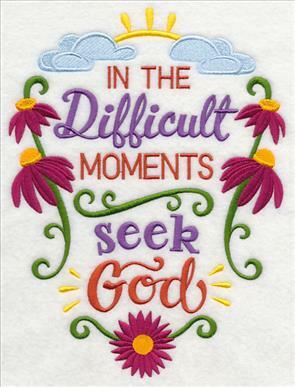 In the difficult moments, seek God. 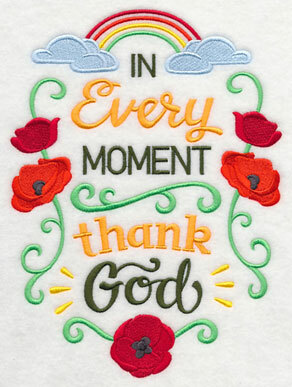 In every moment, thank God." 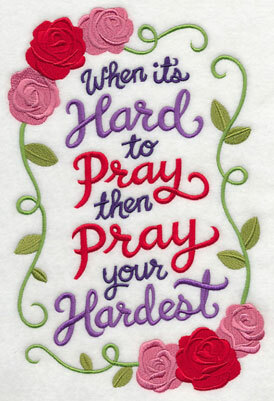 6.80" x 9.00" and 5.82" x 7.70" and 4.82" x 6.39"
Give these words of wisdom their time in the spotlight on a collection of throw pillows, a wall hanging, or a set of placemats. 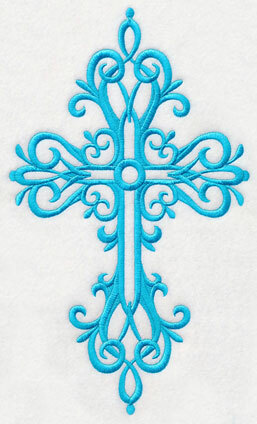 6.65" x 9.01" and 5.69" x 7.71" and 4.86" x 6.58"
A pair of intricate filigree crosses are picture-perfect on pillows, wall hangings, table runners, and more -- and they're surprisingly quick-to-stitch, too! These designs feature just one color, making them a fast and easy way to update any project. 6.86" x 11.45" and 5.75" x 9.40"
4.77" x 7.80" and 4.19" x 6.85"
6.90" x 9.97" and 5.90" x 8.53"
5.40" x 7.80" and 4.76" x 6.88"
Combine the majesty of classic religious symbols with the beauty of Battenburg lace, and you'll have these lovely lace medallions! 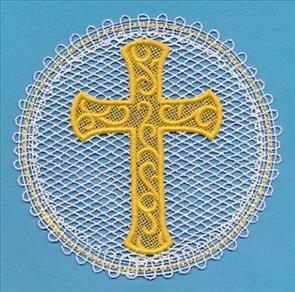 A mix of timeless Battenburg lace and classic freestanding lace give these designs a unique, elegant style. 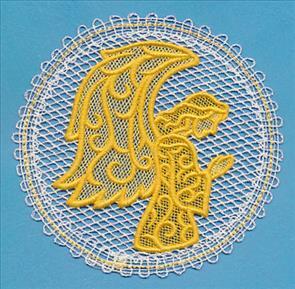 5.90" x 5.87" and 4.90" x 4.87" and 3.88" x 3.86"
Get helpful tips and tricks for embroidering Battenburg lace right here. 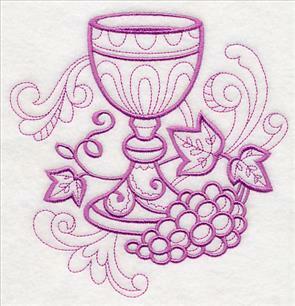 Or, watch our video demonstrating how to embroider this gorgeous style of lace here. 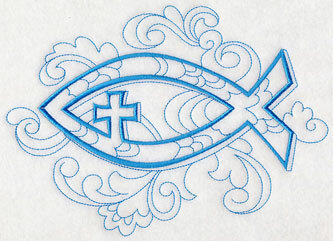 There are four different medallions to choose from: praying hands, a cross, an icthys (Jesus fish), and an angel. Pick your favorite, or stitch them all! 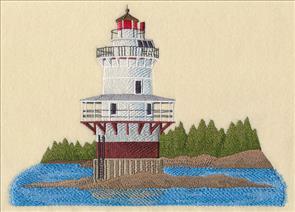 Marianne was looking for designs featuring lighthouses from Vinalhaven, Maine, and the Goose Rocks Lighthouse is a gorgeous choice. 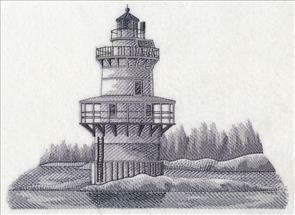 Located at the eastern entrance to the Fox Islands Thoroughfare, this light has stood guard since 1980. 9.53" x 6.91" and 7.80" x 5.64" and 6.73" x 4.85"